Update – Suspect Arrested…… Charges upgraded. Update – It happened here in South Florida as well. Kristallnacht in Germany was November 9th 1938. On November 30th 1947, a vote was taken at The United Nations, creating The State Of Israel. 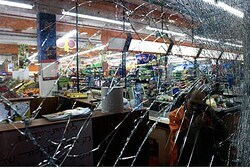 Vandals hurled bricks through the plate glass windows of a kosher restaurant, a kosher pizza shop, two Judaica stores, and a Jewish-owned hardware store. At least three other Jewish-owned establishments in nearby New Brunswick were also similarly attacked, including the Rutgers Chabad House, the Rutgers Hillel and an Israeli-owned falafel eatery. However, police cautioned that it was “too soon to reach a conclusion” as to the nature of the crimes. I’m sure each and every one of the businesses around those Jewish-owned establishments were hit as well, so of course there’s no discussion whatsoever that there’s any possibility of a remote chance of a hint there’s one iota of anti-Semitism at play in these (at least ) eight locations. I’d better not say anything else. 1. Some of us – that dreaded 22% you’ve lately been calling typical bitter clingers – tried to tell you for decades this was coming, but no, you had to ignore everything right in front of your eyes and stay the course for those same decades. ‘Can’t we all just get along ?’ — ‘Coexist’ — ‘Stop with the kicking’ — and then there’s the single most offensive thing I’ve ever heard when it comes to your dealing with your family and friends on the left, those oh-so-special typical Muslims and anti-Semitism in general: ‘If we’re nice to them, they’ll be nice to us’. 2. Tool up. That means go get some evil scary-looking guns, learn how to safely handle and use them and get ready, because “it can’t happen here” is happening here. Oh wait…… Jews (and Americans) in New Jersey, New York, Illinois, Califailure, Hawaii and most of the other ‘blue’ states: Never mind about point #2, because you can’t tool up. Hell, you can’t even legally defend yourself with a broomstick in those states either. You’re S.O.L. Update December 1st 2011 ; 6:15am Eastern. MYFOXNY.COM – Police have arrested a New Brunswick man in connection with vandalism against Jewish-owned and Jewish-centric businesses in Highland Park, N.J. Authorities charged Richard M. Green, 59, with five counts of criminal mischief, according to Middlesex County Prosecutor’s Office. Police believe he smashed the windows of five businesses on Raritan Avenue overnight. What a load of boole sheet, pap and snorkel residue. I stand by everything I said above this update. I’ll put something in because I know you’re thinking of it. Yeah, yeah, yeah, I know…… If these were MooseLimbQuranimal businesses, this ‘event’ would be the only thing on national media, that whoever did this is a perfect example of every typically bitter tea-partier, it’s Bush’s fault, etc. I’m not gonna go there, because here at I.S.U., we don’t deal with ‘what if’ scenarios. We deal with ‘what is’. Update December 2nd 2011 ; 6:15am Eastern. Charges against New Brunswick man upgraded to bias intimidation. A New Brunswick man was charged with three counts of third-degree bias intimidation arising from a series of window-smashing incidents at Jewish businesses in Highland Park, and Jewish businesses and a school in New Brunswick and a religious center at Rutgers University in New Brunswick, Middlesex County Prosecutor Bruce J. Kaplan said late Thursday. Something’s not right here and I’m getting that ‘odd twitch’ about the whole thing…… Not good when I get that ‘odd twitch’. Please see a comment below posted by Rabbi Dr. Roasenberg. It happened here in South Florida as well. Thursday 1 December – Gets reported YESTERDAY 4 December. The fire broke out early Thursday morning. Hollywood firefighters extinguished the blaze in minutes. The fire was quickly determined to be arson, said deputy chief Mark Steele. He said the fire started in religious texts stored on shelves in the office. This entry was posted on Wednesday, November 30th, 2011 at 22:43 and is filed under The Constitutional Watch. You can follow any responses to this entry through the RSS 2.0 feed. You can leave a response, or trackback from your own site. It fits. In Germany “Germans don’T buy Jewish” is acceptable again. Across the EU “anti-semitism” (what a nice way to put it) is “in” again. Now this. I’ve said for a while that we’re back in 1930. The sides are drawn up. I stand with Israel. And I will defend the foolish American Jews who have chosen the Left all of these years. They’re going to need the help as the hyenas turn on them. Well, I guess Hitler was really just a prankster, right? Nothing has changed. Just the color has. Back in the days it was the Jews murdering Jesus, kidnapping babies for blood rituals, or simply being blamed for military defeat. Today it’s occupying “Palestine”, “murdering Palestinian fighters” and harvesting their organs (I remember some Norwegian Doctors without borders doctor claiming that), and them being… Jews. Back then it was called hating Jews. Today it’s called anti-Semitism, or, if we’re politically correct, being critical of Israel. But see, no matter what you call a turd, it’s still a turd. It’s still garbage and stinks. Shalom Rabbi and thank you for the information. I will be delving into this – deeply – at least as much as possible given the complete lack of media coverage outside of the immediate area of New Brunswick/Highland Park. Two dozen with the cat, in public. That works. If he does it again, jail time. I used to be a friend of this soft approach. Forgive and forget. But in reality, this approach doesn’t work. Never has. Never will. It’s not a sign of superiority. It’s a sign of weakness. Rabbi Rosenberg’s comments are accurate. According to many sources, mysteriously not being reported by the media, the person under arrest is a Jewish man who has a history of mental health problems. One of the store owners told me he knows the man, and he even shopped in his store regularly.